Civil War letter of Robert Hamilton Harris, 29th Georgia Regiment, while encamped at Brunswick, GA. Even before the secession of Georgia, Levi J. Knight, pioneer settler of Ray City, GA, had gathered a company of men, styled the Berrien Minute Men, to serve as volunteer infantry. Knight, an old Indian fighter, politician, railroad investor, developer and social leader of south Georgia, anticipated of the formation of the Confederate States Army. In the winter of 1860, he convened a meeting at Nashville, GA, seat of Berrien County which then included present day Lanier, Atkinson, Cook and Tift counties, as well as present day Berrien, where the company endorsed the Resolutions of the Berrien Minute Men. In the spring of 1861, the Berrien Minute Men encamped and drilled at Nashville, GA. On May 17, a Grand Military Rally was held at Milltown (now Lakeland), GA on behalf of the Berrien Minute Men. The following month, Knight’s company of Berrien Minute Men was ordered to report for muster into the Thirteenth Regiment of Georgia Volunteers. Savannah Daily Morning News, July 24, 1861 reports Berrien Minute Men have received orders to join the formation of the 13th Georgia Regiment, in replacement of Colonel Paul J. Semmes regiment. Semmes regiment, the 2nd GA Regiment, which had been on station at Brunswick, GA had been ordered to Virginia. Brunswick Riflemen, Captain B. F. Harris, Brunswick. Lowndes Volunteers, Capt. G. T. Hammond, Valdosta. Ochlocknee Light Infantry, Captain W. J. Young, Thomasville. St. Mary’s Volunteers, Capt. A. B. Dufour, Darien. Seaboard Guards, Captain John C. Nichols, Waynesville. 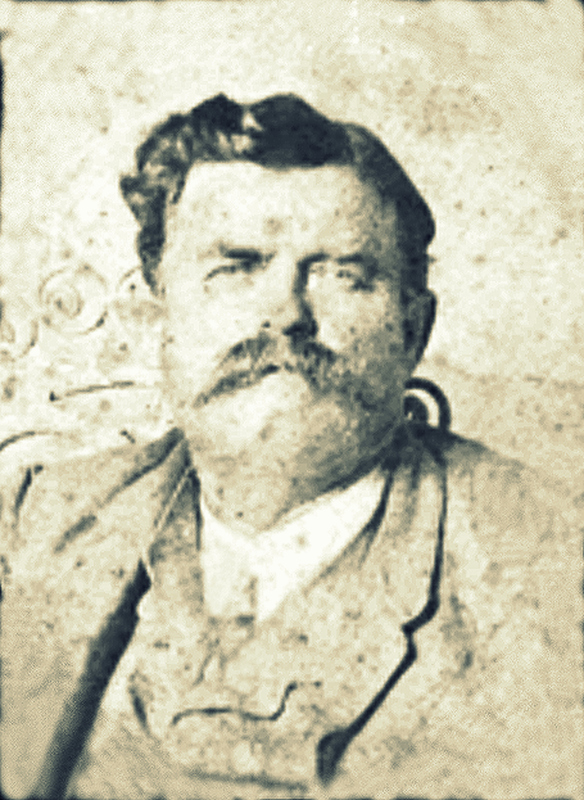 Berrien Minute Men, Captain Levi J. Knight, Nashville. Piscola Volunteers, Captain William A. Lane, Quitman. –Atlanta Intelligencer, July 21st. Per orders, Captain L. J. Knight took his company of Berrien Minute Men to the Georgia coast where they and other volunteer companies from south Georgia counties were garrisoned at Camp Semmes for the defense of the port at Brunswick, GA. Camp Semmes, south of the city, had been established by Colonel Paul J. Semmes, commanding officer of the 2nd Regiment Georgia Volunteer Infantry. The defense of Brunswick had been the responsibility of the 2nd Regiment until that unit was ordered to Virginia. Around mid-June, General Lafayette McLaws, Brigadier General A. R. Lawton, and Captain William W. Echols had visited Brunswick to inspect the troops at Camp Semmes. Colonel Semmes and the 2nd Regiment had established security checkpoints for all vessels entering the port of Brunswick. July 4, 1861 Colonel Semmes publishes a circular with requirements for all ships making port at Brunswick, GA. The Berrien Minute Men were among the companies detailed for defense of Brunswick. Brunswick, GA., 4th July, 1861. Public attention is respectfully directed to the annexed circular, and notice given that all boats are expected to conform to its requirements. Passengers are ordered not to take passage in any boat until assured by its master of his intention not to disregard the same; and in order to avoid accidents or detention to themselves, to compel, if need be, his compliance therewith. CAMP SEMMES, BRUNSWICK, GA., June 25, 1861. I. On and after this day, all boats or vessels of any description, passing up or down the river, will be required to set their colors, or, if they have none, to heave to and report themselves to the officer of the day, at Camp Semmes, during the day. After sun-down every vessel will heave to and reply to the questions of the sentinel or officer of the day. One shot will be fired across the bow of any vessel attempting to pass without heaving to, when ordered, and if, after one shot, she attempts to proceed, she will be fired into. Among the companies replacing the 2nd Regiment at Brunswick were the Berrien Minute Men with the Thomasville Guards, Piscola Volunteers, Seaboard Guards, Brunswick Rifles, Glynn Guards, and Wiregrass Minute Men. While encamped there, Robert Hamilton Harris, of the Thomasville Guards, described the camp and his experiences in a letter to Martha (Mattie) Love, his girl back home in Thomas County, GA. She was a daughter of Peter Early Love, U. S. Congressman and former Solicitor General serving old Lowndes County, GA.
A portion of this correspondence has been preserved and scanned in the collection of Civil War letters of Robert Hamilton Harris, housed in the Digital Library of Georgia. Unfortunately, the extant portion of this letter is not dated. However, we can surmise from contemporaneous events described by Harris that it was written about mid-July 1861.
the prize (a boat) before she reaches Savannah. Our men will probably blow her up should any U. S. vessel attack them. She is laden with near $40000 worth of sugar, and was captured by the Jeff Davis on the coast of Newfoundland. There are seven companies now encamped in Brunswick, viz. the Thomasville companies, the Berrien Minute Men, Piscola Volunteers, Brunswick Riflemen, Seaboard Guards, and the Wiregrass Minute Men, all of them very fine companies. We will soon be ready for double our number of Federals, and then we will feel easier. Our boys seem to enjoy themselves, and I know I do. We have very hard fare, and have to endure a great many hardships, but we are healthy and have fine bathing facilities. Some of us are in the water nearly all the time. I plunge in regularly every morning at daylight, and spend half an hour or so in the delightful exercise of swimming, after which I don’t go in again during the day. I think this is the best plan. A very large shark showed himself in our bathing place this morning, but we all went in as soon as he left, for we can’t forego this healthful pleasure because we happen to see a shark in the neighborhood. Four of these companies, the Piscola Volunteers, Brunswick Rifles, Seaboard Guards, and Wiregrass Minute Men, would later be reorganized into the 26th Georgia Regiment of Volunteer Infantry, along with companies from Lowndes, Ware, Clinch, McIntosh, Pierce and Twiggs counties. Harris’ letter mentions that one man of his company, John Bernard, had attempted suicide by cutting his throat. But Dr. [Edwin A.] Jelks of the Piscola Volunteers [Brooks County, GA] was able to suture the wound and keep the man alive, at least temporarily. Jelks, who was a relative of Harris’ intended, went on to become Surgeon of the 26th GA Regiment. The 26th Georgia was also the regiment Albert Douglass would join after deserting the Berrien Minute Men in 1862. Harris also included with his letter a sketch of Brunswick, showing the position of the regimental camp south of the city. Robert Hamilton Harris’ 1861 sketch of Brunswick, GA showing location of the encampment of Captain Levi J. Knight’s company of volunteer infantry, the Berrien Minute Men. The camp was situated south of the city on the bank of the Turtle River, with the river front on the west, cedar groves to the north and south, and woods to the east. The Berrien Minute Men (marked B.M.M.) were positioned on the northeast corner of the regimental grounds with the rest of the companies on the north side and on the riverfront. The regiment kept a picket guard on the southernmost tip of the peninsula. The marsh on the east side of the peninsula Harris incorrectly labeled “Bloody Marsh” -the actual Bloody Marsh is on the east side of St. Simons Island. Brunswick’s wharves on the Turtle River are shown, as well as Oak Grove Cemetery, the Darien Road, the Waynesville Road. Harris’ map also depicts a “prize” ship anchored off the Brunswick wharf. This may have been a U.S. vessel captured by the privateer schooner Triton, of Brunswick, GA. The Triton was the very first privateer to be commissioned by the Confederate government. Confederate president Jefferson Davis had authorized privateers on April 17, 1861 and the Triton was commissioned on May 10, 1861, the day the orders were published. The Triton was a small, 30-ton schooner, armed with a single six-pounder gun. The railroad shown on Harris’ map would have been the shortline Brunswick & Florida Railroad, which connected at Glenmore, GA with the Savannah, Albany & Gulf Railroad and the Atlantic & Gulf Railroad. The Atlantic & Gulf was intended to serve as a “Main Trunk” for the two coastal railroads, and it was planned to stretch across south Georgia to steamboat docks on the Flint River at Bainbridge , creating a passenger and freight connection to the Gulf of Mexico. By 1860, the Atlantic and Gulf had reached the site of Valdosta, GA, bypassing the Lowndes County seat at Troupville, GA.
Civil War era map of the Brunswick & Florida Railroad, running to Brunswick, GA – Atlas to Accompany the Official Records of the Union and Confederate Armies. The captain of the Berrien Minute Men, Levi J. Knight, was an investor in both the Brunswick & Florida Railroad, and the Atlantic & Gulf Railroad. The state of Georgia had also invested half a million dollars in Brunswick & Florida stock because of the railroad’s perceived strategic value. An advantage of these connections, it was said, was that the railroad could move men and materials from ports on the Gulf of Mexico to the Brunswick port on the Atlantic in 24 hours “in case of war between this country and a foreign nation.” The B&F connection to the Savannah, Albany & Gulf also provided convenient transportation between Brunswick and Savannah, GA. The Savannah newspapers noted that the Berrien Minute Men and the rest of the 13th Regiment arrived in Savannah on July 30, 1861 via railroad. At that time, they received equipment issued by the Confederate army. They number some eighty-five men, rank and file. This corps numbers some seventy men. In August, the seven companies Harris noted at Camp Semmes were joined by the Camden Rifles and the Glynn Guards. On Saturday, August 19, 1861 these nine companies were formally mustered into the 13th Georgia Regiment, under the command of Colonel Cary W. Styles, of Ware county. It appears that the Lowndes Volunteers and St. Mary’s Volunteers were late for reporting at Camp Semmes, and were not mustered into the 13th GA Regiment. The Lowndes Volunteers later mustered into the 26th GA Regiment. Another Lowndes company (Company I, 12th Georgia Regiment) under the command of Captain James W. Patterson was already in Virginia. General McLaws encountered them June 21, 1861 at Branchville, VA. In a letter written from Petersburg, VA McLaws described traveling with the Captain Patterson’s company of Lowndes company over the period from about June 21 to June 24. We succeeded in starting [from Weldon, NC] about 8 P.M. in an extra train consisting of twenty freight cars and one passenger car. I have said we, because on arriving at Branchville, from Augusta a company of 116 Volunteers from Lowndes County Ga got into the train, and from that time, there was an end to all individuality. I managed to preserve my seat entire, by piling my overcoat, pillow & carpet bag beside me. But they were all around me, in all various attitudes conceivable, and dressed and undressed as suited their humor or degree of heat, artificial or natural, they had steamed up to at the time – one person, the wit of the party, said that if any body would give him a dollar he would sit in his shirt tail, and for an additional half would then pull off his shirt. Most of them pulled off their shoes, some had socks and others none and many were only partially provided. As the heat increased the fetid odor was tremendous – which added to the insane idea peculiar to volunteers that it was the patriotic duty of each and every one to hurrah and yell on passing through any settlement,made the time pass remarkably slow. And whenever we stopped a moment there was a general rush out in search of water, and then when the conductor shouted “get aboard” various fellows would say “I cant find a board but can get a shingle if you want one!” – all of which added to the general hilarity and made the night rather a sleepless one. When the crowd was put into the baggage cars, the noise was none the less but it was further off, so that second night passed more quiet. But today the passenger car was crowded with them again, and the odors and the singing and the patriotic yelling was truly remarkable. The Lowndes company, however, are a very fine looking body of men and in fact are remarkably well behaved, and have a Captain who has them under complete control by the mere force of his personal influence, his name is Patterson and I have no doubt he will do credit to his state. Unfortunately, through a lack of coordination there was some duplication in the numbering of the Georgia regiments, and as it happened, there was already a 13th GA Regiment in service in Virginia. In a short time Col. Styles regiment was reorganized, with the majority of the companies remaining at Brunswick to form the nucleus of the 26th GA Regiment while the Berrien Minute Men, Thomasville Guards, and Ocklocknee Light Infantry were ordered on to Savannah, GA to be mustered into the 29th Georgia Regiment. Hamilton W. Sharpe was a pioneer settler of Lowndes County and a contemporary of Levi J. Knight, who settled at the site of Ray City. The two fought together in July, 1836 actions against Indians which occurred in this immediate area including the Battle of Brushy Creek and actions on Warrior Creek in what was then Lowndes County (now Berrien and Cook counties,) Georgia. As has been discussed, one of the first roads of any kind to be constructed through south Georgia was the Coffee Road, built by General John Coffee in 1823. It was a “road” only in the sense that it was a path cleared through the forest with tree stumps cut low enough for wagon axles to clear them. One of General Coffee’s overseers in the laying out of the road was Enoch Hall, a son of Sion Hall and Mrs. Bridget “Beady” Hall. The Halls were among the very first settlers in the area of Irwin County that became Lowndes county by an act of the Georgia Legislature, December 23, 1825. At July , 1824 term of the Irwin County Inferior Court July term, 1824, Sion Hall, James Allen, and Thomas Townsend were appointed to lay out a road from Ocmulgee River to Alapaha River. 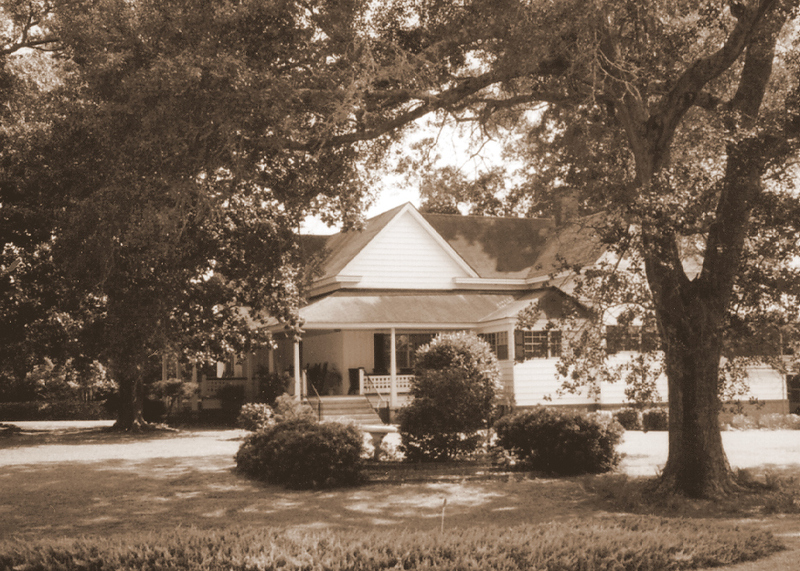 Sion Hall established a tavern on the Coffee Road, about two miles north of present day town of Morven,GA and his brother, John Hall, operated a liquor bar there. In 1826, Hamilton W. Sharpe, then a young man hardly in his twenties, came down from Tatnall County over the Coffee Road, and decided to locate near the home and traveler’s inn of Sion Hall. It was at Hall’s Inn that the first court in Lowndes County was held a few months afterwards. Sharpe along with others expected that the permanent county-seat would be established there. So young Sharpe built a small store building out of logs near the Sharpe home. Thus, Hall’s Inn and Sharpe’s Store were situated approximately 25 miles southwest of present day Ray City, GA, the site first settled by the Knight family in the winter of 1826. In 1828, Hamilton W. Sharpe obtained the establishment of a U. S. Post Office at his store, for which he was appointed Postmaster. The Sharpe’s Store Post Office served Wiregrass Pioneers for almost 25 years. 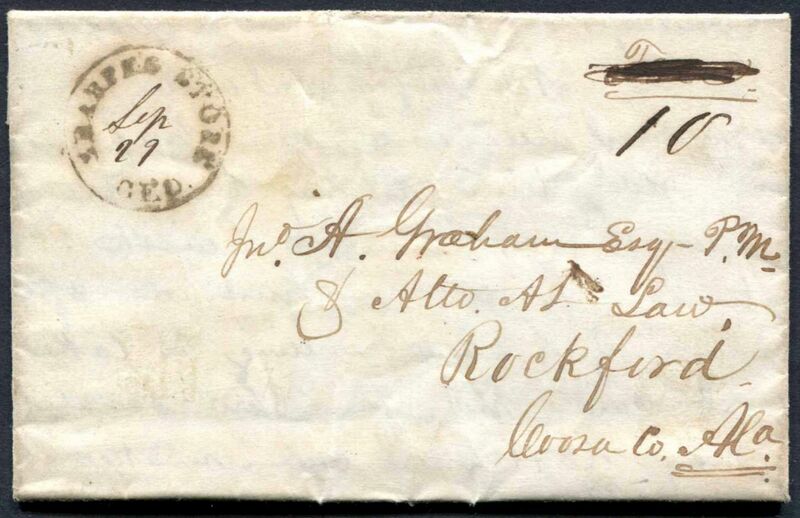 Post marked Sharpe’s Store, Geo., September 29, 1849. In December of 1846, Hamilton Sharpe responded to a letter to the editor published in the Savannah Daily Republican, written by a subscriber from Okapilco, Lowndes County, GA. Okapilco was on the mail route from Franklinville via Sharpe’s Store to Bainbridge, GA. Without naming names, this subscriber appeared to be complaining about the way Postmaster Sharpe charged postage due on the mail, the selection of mail routes, the infrequency and irregularity of the mail service, even the quality of the conveyance by which the mail was delivered. To these criticisms Hamilton Sharpe took great offense, and his written, point-by-point response was in turn published in the Republican, transcript below. Sharpe’s Store, Dec. 28, 1846. Again, he says “there are two routes from Savannah, one via Darien not over two hundred miles.” He must be very ignorant of the rout over which the mail travels “via Darien,” or he would not risk his love of truth in such a glaring assertion. It had not even been a doubt in my mind whether it is not more than three hundred miles from this to Savannah even by the route via Darien; but as I had no means of ascertaining the precise distance, I was disposed, if I erred at all, to err on the side of the public, and consequently charged five cents on all letters not exceeding half an ounce in weight, until by general consent (“Subscriber” exempted, I suppose,) the mail was changed on the other route, which every body knows to be four hundred miles and upwards. In 1845, I corresponded with Mr. Schley, the Post-Master, in Savannah, on this subject – a gentleman whom I have ever considered as worthy of the confidence of the public – and I am persuaded that he has said in good faith in discharge of his duty, and will not deny but what his way-bills, are invariably, since the change was made in the rout, charged ten cents on all letters from his office to this. This gentleman, the “Subscriber” from “Okapilco,” whoever he is, seems to be very censorious. He wants the mail oftener, &c., and who does not? But how are we to get it, by writing to you a letter of censure and compalints, embellished with a few of his little “cat’s paw” flourishes of wit, implicating the conduct of Post-Masters, in the discharge of their official duty? If this is the way we are to get a change in our mail arrangements, it will present a new aspect to matters and things in the Post Office Department, and besides he will not get many to follow in his walks. But let him go to work at the right place, instead of censuring the “little powers that be” – let him supplicate the law-making power, and his course will be considered by all to be more open and generous at least, and no doubt he will gain the co-operation and influence of the community at large. Why arraign the Post-Master General in this matter – we have as many mails now as we had under former Administrations, and get them as regular, and there is as few complaints, and as few causes of complaints. Perhaps “Subscriber” wants a mail route established for his own especial benefit, twice or thrice a week, and then he would be “blest by the light spreading influence emanating from Cave Johnson’s Express,” sure enough. I am at a loss, Messrs. Editors, to know which looks the worst to a man “up a tree,” “little men in big places,” or big men in little places. If “Subscriber” is acquainted with “Euclyd,” perhaps he may solve the question himself. Does “Subscriber” know what the new Post Office law is, with regard to this matter? If he does not, he had better inform himself on the subject. It is found on the first page of the new “Post Office Laws and Regulations,” beginning with the first clause, and if he cannot understand its mystifications, let him employ a lawyer. I will now take leave of your “Subscriber from Okapilco, Lowndes Co., Ga.,” who, it seems, would seek some notoriety at other men’s expense, but who is very careful to conceal his real name. Death came for Edward M. Henderson, Sheriff of Lowndes County, GA on July 20, 1836, he having been mortally wounded in the Battle of Brushy Creek five days earlier. In death he joined those killed in action at Brushy Creek – Pennywell Folsom and Edwin Shanks of Lowndes, and Burton Ferrell of Thomas County. Nine other settlers were wounded in the battle. The names of the Native American dead, “who had been goaded into madness” are not known. Captain Levi J. Knight, original settler of the Ray City, GA, arrived at Brushy Creek with a company of men just after the conclusion of the fighting, having marched across the county from and earlier engagement at William Parker’s place. Knight and the troops from Brushy Creek were then engaged in actions along Warrior Creek. 1834 Lowndes County, GA Tax Digest assessment of the property of Edward Marion Henderson. For his 1,215 acres, Henderson paid $0.78 cents in property taxes. Edward Marion Henderson, also known as Edwin Henderson, was born in 1810, a son of David A. Henderson. He was born and raised in Liberty County, GA before moving with his parents to Ware County, GA. On July 3, 1829, he was commissioned as Postmaster at Waresboro, Ware County, GA, and served until June 4, 1830. He was Tax Collector of Ware County from 1828 to 1832. In 1832, he came to settle in Lowndes county, GA on Land Lot # 168, 15th District, in that area which was later cut into Brooks County. He was elected Justice of the Peace for the 659th District of Lowndes, serving from 1833 to 1834. He was elected Sheriff of Lowndes County on April 4, 1834, while Franklinville was still serving as the County Seat. Martin Shaw was his Deputy Sheriff. According to Lowndes County Tax Digests for 1834, Edward M. Henderson owned 965 acres on lots 168 and 155 in the 15th District, near the Withlacoochee River, and 250 acres on Lot 150 in the 15th District in Thomas County. In 1835, he retained only the land on Lot 168. Edward M. Henderson married Martha McMullen in 1835; she was born 1813 in Telfair County, GA, a daughter of James McMullen. Her father was a prominent citizen of Lowndes, and served as a representative in the state legislature. When Indian troubles began in 1836 following the uprising at Roanoke, GA, Edward M. Henderson served with the Lowndes County militia. He was mortally wounded in the Battle of Brushy Creek and died a few days later on July 20, 1836, leaving behind his young wife and infant daughter. The site of his grave is not known. The estate of Edward M. Henderson was administered by his brother, Samuel T. Henderson, and his home place on Lot 168, 15th District was sold at auction in December 1838. His widow, Martha McMullen Henderson, with baby Rebecca Henderson returned to her father’s home. She never re-married. When Rebecca married Joel M. Morris in 1854, Martha moved into her son-in-law’s household in Jefferson County, FL. In May of 1861, Wiregrass Georgia prepared for the coming Civil War. In Berrien County,GA General Levi J. Knight drilled his company of Berrien Minute Men. The Brooks County Rifles assembled under the command of Captain John Clark Mounger, and in Lowndes County, the Lowndes Volunteers were led first by Captain George T. Hammond, then by Captain James Patterson. On May 28, 1861, the Savannah Republican published a letter from Valdosta, GA with a report on the crops and military matters of South Georgia. Crops and Military Matters in Southern Georgia. Mr. Editor: Thinking that it would be of some interest to your readers to hear of the condition of the crops and of the military preparations of Southern Georgia, I have concluded to furnish them, through the columns of your valuable paper, with the necessary information. First, in regard to the crops: they are very promising. Corn looks well, and the oat crop was never better. Potatoes, sugar cane, and cotton, notwithstanding the backwardness of the spring, are growing off finely, and everything up to the present time, as we have had fine seasons of rain, indicates a heavy yield to the husbandman in harvest time. As to military preparations, the county is alive with volunteers, and all eager for a fight with the Abolitionists. Our citizens have liberally contributed funds to equip and prepare for service the poor men connected with the companies, and also to supply with provisions and clothing the destitute families of those who shall enter the service. And I would say to Governor Brown, as an humble citizen not presuming to dictate to him his duty, while he stands at the helm of State, if he wishes to sustain the reputation of the Empire State of the South for bravery and skill in marksmanship during the present campaign, by all means select as many companies as possible from Southern Georgia, for the men of this portion of the State are accustomed to handle the plow and the rifle. They can toil and shoot with great accuracy, and, as an evident fact, it is said on good authority, that there is not a man in Gen Knight’s company of volunteers,in Berrien county, numbering eighty, rank and file, but who can kill a deer one hundred yards with rifle running. The men composing the company are tall, active and efficient – the men for the camp and the battle field – and all they ask is a showing. There is also the Lowndes Volunteers, composed mostly of active and brave young men, commanded by Captain Patterson, their former Captain, George T. Hammond, having resigned. This company is now in camp, drilling and preparing themselves for the field; also, the Brooks Rifles, commanded by Captain Mounger, and others that might be mentioned; but suffice it, Mr. Editor, Southern Georgia is ready and prepared for any emergency, and if old Abe or any of his hirelings should attempt to invade our shores they will be swept off like the Egyptian flies before the winds of the Sahara. 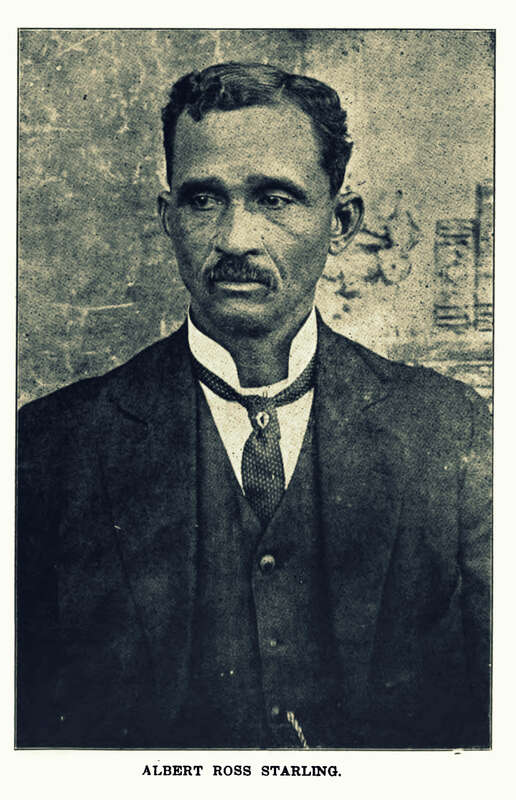 Reverend Albert Ross Starling was pastor of an African-American church at Ray City during the early 1900s. He also served as pastor of New Bryant Baptist Church in Milltown, and First Baptist Church of Waycross, and several churches in Brooks County. Neither races nor nations rise or develop as a whole. It is all a matter of individual progress, and no race can rise above the level of the individuals of which the race is composed. It sometimes happens that the progress of a people is best illustrated for a given period by the life of some man cotemporary with that period. For instance, the life record of Rev. Albert Ross Starling, a successful Baptist minister of Waycross might be used to illustrate the progress of his people since the Emancipation, as he was born soon after the war and so represents in his own life and work practically the period of freedom. The date of his birth was April 10, 1867, and the place was in Brooks County. His parents were Joe and Martha (Calker) Starling. His maternal grandparents were Shiloh and Betsy Calker. As a boy young Starling worked on the farm. His education was begun in the local schools of Brooks and Thomas Counties. In 1890 he finished the Normal Course of the International Correspondence Schools at Scranton, Pa., and in 1918 he finished the Theological Course of Princeton University at, Princeton. Ind., and received from the institution the D. D. degree. He had grown to manhood before he became active in the work of the Church and was a man of thirty years of age with a family before he dedicated himself to the preaching of the Gospel. In 1898 he was ordained to the full work of the Gospel ministry by the Elizabeth Baptist Church of Brooks County and has since made a record which has endeared him to his people. 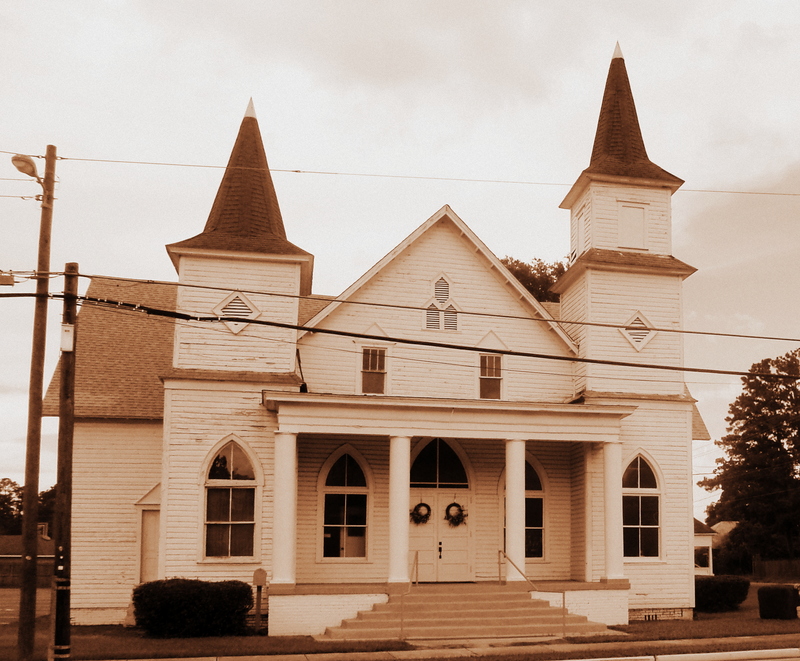 His first pastorate was the New Zion Baptist Church which he served one year and repaired the church. Since then he has served a number of other churches which have prospered under his administration. He preached at New Macedonia for twelve years, bought land and built a new house of worship. He pastored Centenary seven years and remodeled the church. St. Paul five years and built a new church. One of his most successful pastorates has been the New Bryant Baptist Church at Milltown where he is now (1919) in eleventh year. With his coming the congregation took on new life and a commodious new house of worship was erected. An historical sketch of this has been published under the direction of the pastor. In 1913 he accepted the call of the First Baptist Church of Waycross, where he resides. The house of worship has been completed and the congregation strengthened. Other churches he has served are Ray City and Pleasant Hill. Rev. Starling ministers to his people in every helpful way and grows in the esteem of his congregation from year to year. He is an effective speaker and has had a fruitful ministry. He is Clerk of the New Bryant Association and a trustee of Central City College. As a young man and even in the early years of his ministry he taught school for more than a dozen years. More recently he has devoted his entire time to the work of the ministry. He is a regular attendant at the State and National Conventions. Among the secret orders he is identified with the Masons, Pythians, Odd Fellows and is State Auditor for the Eastern Star. His property interests are at Boston and in Brooks County. His experience as a teacher and preacher leads him to believe that the thing most needed by the race is efficient educational and religious work and leadership. Lasa Adams [sometimes referred to as Lacy Adams] was born May 13, 1811, in Georgia, a son of Dennis Adams. While yet a boy, his parents moved first to Alabama then to Gadsden County, FL, where he grew to manhood on a frontier still troubled by conflict with Native Americans who resisted being displaced from their ancestral lands. It was around 1834 that Lasa Adams came to Thomas County, GA and on December 1, 1834 he married Sarah Wooten, daughter of Redden Wooten of the Tallokas district (territory now in Brooks). Another of Wooten’s daughters married Morgan G. Swain, who owned a hotel at Troupville, GA.
Lasa Adams left this area in the 1850s to make his home in Florida, but not long before his death June 17, 1894, he returned to Brooks County after an absence of forty years. On May 5, 1893 Lasa Adams, responded to a questionnaire by William T. Gaulden about the Battle of Brushy Creek. From Lowndes County militia rosters, it appears that Lasa Adams was living in the 660th Georgia militia district (the Morven District) at the opening of the Second Seminole War in December 1835. When Governor William Schley called for the formation of general militia companies in Wiregrass Georgia, Lasa Adams, Pennywell Folsom, Lewis Blackshear, Samuel Slaughter, Noah H. Griffin, William Alderman and 85 other men of the district were organized under Captain William G. Hall. While Hall’s unit was not in active service, Adams later served in Captain Benjamin Grantham’s company of men. Although Adams joined Captain Grantham’s Company a week after the Battle of Brushy Creek, he was intimately familiar with the participants and subsequent engagements against the Indians. Mr. Adams recalled that the Indians were Cherokees who were fleeing “to the Seminoles in Florida, near Tampa Bay” to escape the forced relocation to western territories. Adams questioned the purported force of Indians ranging through the district that July of 1836 “estimated to be 300, but I have my doubts. I think 150 would be a fair count. About 300 men were after Indians but only about one hundred were in the battle,” which took place “about the 12th or 13th of July, about 10 or 11 o’clock a.m.” and lasted about two hours. The story of how Pennywell Folsom fell at Brushy Creek was posted previously. According to Ferrell family research, a brief note on the death of Burton Ferrell appeared in the Milledgeville Southern Recorder a few days after the incident. KILLED…. On Friday the 15th ultimo in the county of Lowndes, BURTON FERRELL of the county of Thomas, was killed in battle with a band of Creek Indians. It is not the intention of the writer to eulogize the deceased, but this much it is considered necessary to say, that Mr. Ferrell was brave almost to a fault; for he refused to take shelter which the trees might have afforded him in the fight, and rushed fearlessly in the front of the company, and was shot through the body at the first fire of the enemy. Adams noted that among the Indians, those killed at Brushy Creek were “about 15 or twenty, including women and children” and captured were “eight to ten women and children…no men taken.” These prisoners were taken to Thomasville, GA where they were held about a month before being sent west. Following the Battle of Brushy Creek, Lasa Adams was drafted to serve in a Thomas County company under Captain Grantham in further actions against the Indians on Warrior Creek. The local militia was joined on August 12, 1836 by forces of General Julius C. Alford, who had pursued the Indians from the Alabama border above Chickasawhatchee Swamp north of Albany, GA. General Alford assumed command of the combined forces which by now included Capt. Grantham’s company as well as the companies of Capt. Pike, Capt. Newman, Capt. Burnett, and Captain Levi J. Knight. Following the advice of Captain Knight, their goal was to prevent the Indians from reaching Grand Bay, near present day Ray City, GA, and thus cut off their rendezvous with the force of Indians gathering in the Okefenokee Swamp. Lasa Adam’s responses to the questionnaire on Indian Times, along with his sketch (provided below) of his service in Captain Benjamin Grantham’s company of Thomas County militia during the 1836 Indian War, was posthumously published in the Valdosta Times, November 16, 1895. Adams describes how his company came to the aid of a Company of men, who were the advance force of General Alford. Adams variously refers to the captain of this company as Captain Hawthorne, Hatthorn or Haththorn. Undoubtedly, he is actually referring to Captain Michael Hentz, and his Company of Baker County Militia, who was operating under the orders of General at the time and place described. “Government let out Indian Claims at Cherokee, Georgia, and were to send them out west. Between 3 and 5 hundred were dissatisfied with the treaty made with the chief – and they withdrew and thought they would go and unite with the Seminoles in Florida near Tampa Bay. So they started and crossed over the Chattahoochee River and burned up a town called Roanoak, Georgia. The whites formed companies and went in pursuit of them, and had a fight in Chickasawhatchee Swamp above Albany. Indians were scattered and between 100 and 300 were in the gang that was in the Brushy creek battle. Several more small squads went through the country from 15 to 20 in squads, in different directions. At Brushy Creek, Capt. Scriven Gaulden had a company from Lowndes county, Col. Mike Young from Thomas county, Capt. Hamilton Sharp of Lowndes county, Georgia. They all united, and Capt. Scriven Gaulden led the front guards to battle and made the attack on Indians at Brushy creek and then the fight commenced. Captain Scriven Gaulden was hit by three balls from Indian guns only one took effect right cheek “I think,” one passed through his hat, one hit his pistol in pants pocket (pistol saved his life.) Several more were slightly wounded but don’t remember the names of none, as they were from Lowndes county and strangers to me. All Indians not killed and captured kept their course for Tampa, Fla. In about a week or so after the Brushy creek battle, I was drafted together with 30 or 40 more men, and Capt. Grantham was elected our captain. We were ordered up on the Warrior creek, as squads of Indians were continually passing down that creek. One day while on a scout we heard guns firing. Capt. Grantham ordered a force march and we went as quick as he could in order, and when we got nearly to the place Capt. Hawthorne had followed a squad of Indians from above Albany and had attacked them, and the Indians had whipped him out and he was retreating and the Indians had captured six horses from his men. Then Capt. Grantham, with his men and a few of Capt. Hatthorn’s pursued the Indians and run them in the Little River swamp near James Rountree’s place in Lowndes county (now Cook), and we had to stop, as night overtook us. We camped over the other side of the river, expecting the Indians to come through next morning. That night Buckston, Ison Vaun and myself were detailed to go to Capt. Hatthorn and tell him to come down and draw supplies at Lawrence Folsom’s place. We returned from Capt. Haththorn’s to our camp, and we received news that Indians had gone across the river that night. The Indians had used a little stratagem to fool us. They made a display that night with torch lights as if they were going across the river, so next morning we had to go back to Capt. Haththorn to carry the news that Indians had crossed the river, and about daylight as we were on our way to carry the news we discovered Indians jumping over the road to keep from making any sign, and they were going down the river. So we returned to our camp and reported what we had seen and Capt. Grantham ordered a force march to a ferry three miles below on the river, expecting to head them off, but they had beat us to the ferry and kept down the river swamp. We struck their trail and followed them down the swamp near Maj. Simmon’s plantation and pushed them so close that the Indians took into the swamp and we recaptured the six horses taken from Capt. Haththorn’s men. That night General Aulford [Julius C. Alford] came to us with 30 or 40 men and took command of the forces. A good many volunteered and joined us. Gen. Aulford ordered all the men to string across the river 20 yards apart and drive up, as we had got ahead of the Indians. We had gone about one mile up the river when the Indians used another trick to draw us off. The Indians were seen in Jones’ peach orchard on one side of the rive and in John Blacksher’s peach orchard on the other side. They were fired at by scouts at long range in John Blackshear’s orchard. This shooting frustrated our drive up the river, and we made for Blackshear’s. A little Indian girl about eight or ten years of age went next day to the house of James Williams and Mrs. Williams was at the wash tub washing. The little girl went and put her hands in the tub before Mrs. Williams saw her, and like to have frightened Mrs. Williams to death. Mrs. Williams kept the little girl and raised her and sent her to school and she married a man by the name of Artley. This was another one of their tricks, sending the child in to make us believe they were in that neighborhood. General Aulford went over the river after the squad in Jones’ peach orchard, and I never saw him in about two weeks. We were ordered back to the Warriors and General Aulford followed Indians down in Florida and the Indians went into the Okeefenokee Swamp and he gave them up. I think that was the last squad that passed through. If any more passed, the squads were so small they made no signs and did not bother anyone. “Lasa Adams bought land in what is now the Tallokas district, Brooks county, and engaged in farming. He married Sarah Wooten on December 1, 1834 in Thomas County, GA. There was one son born to that marriage, Dennis R. W. Adams, born 1839. Rhoda Ann Adams, born 1843, married William Hurst of Brooks County, GA.
Jane Irene Adams, born 1845, married J. M. Yates of Brooks County, GA.
James C. Adams, born 1850, married Mary Holman of Jefferson County, FL. Cason F. Adams, born 1852, married Texas Smith, daughter of J. R. M. Smith. Lasa Adams was elected Sheriff of Thomas County in 1842 but resigned a few months after assuming office. Lasa Adams Sheriff’s Sale, 1842. [Note: This legal advertisement appeared in the Milledgeville Southern Recorder, Mar. 29, 1842 – the date printed in the ad is typo. During his short term as Sheriff of Thomas County, one task Lasa Adams dealt with was the sale of two town lots in Troupville, and other goods, to satisfy a debt owed by Joseph S. Burnett and Hiram Hall to Bazzel Kornegay, of Thomas County. The 1850 census of enslaved inhabitants of Lowndes County, GA shows Lasa Adams was the owner of eight slaves. 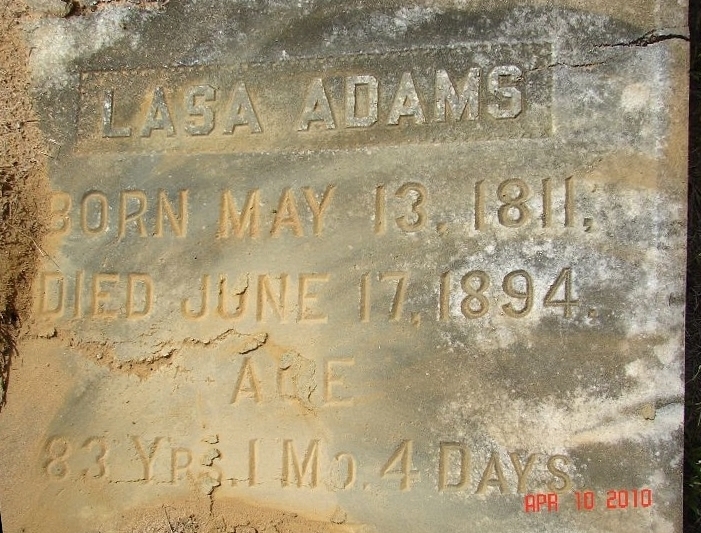 Lasa Adams was buried at Bethel Primitive Baptist Church cemetery. His second wife (Orpha Lee Holloway) died September 28, 1887, and is also buried at Bethel. Sovin J. Knight lived in the Ray City area for many years before moving to the Barney area in 1911. Sullivan Jordan “Sovin” Knight died April 16, 1911 shortly after the move. Nashville, Ga., April 18. – S. J. Knight, formerly of Berrien county, but now of Brooks, dropped dead Sunday. Mr. Knight had a case in the city court Saturday afternoon and had just returned to his home in Brooks county when he expired. Heart failure is said to have been the cause.